The Burma Centre, Tibet Support Group, and International Campaign for Tibet will host a peaceful demonstration calling for sustained attention to human rights to all peoples in China after the Olympics Games. "China ga voor Goud! Geef de mensenrechten na Beijing 2008 een kans!" "China Go For Gold! Give Human Rights in Beijing A Chance!" On 8 August 2008, the Opening Ceremony of the 2008 Olympic Games will mark a momentous event in Chinese history in Beijing. By then, the Olympic flame torch relay will have completed its journey through six continents and throughout China – as a symbol for peace between nations and peoples. This message also passed through East Turkestan, Inner Mongolia, Taiwan and Tibet. These groups are joined together in UNPO, and are united by democratic and nonviolent principles. Our common objective is to protect and promote their human and cultural rights, preserve their environments, and find nonviolent solutions to conflicts which affect them. East Turkestan is a western territory in China inhabited by an ethnically Uyghur majority. The World Uyghur Congress (WUC) seeks to promote democracy, human rights and freedom for the Uyghur people and uses peaceful, nonviolent, and democratic means to determine their political future. Their movement is faced with arbitrary arrests, torture, and executions as the People’s Republic of China (PRC) government has abused anti-terrorism policies to suppress all forms of Uyghur protest, no matter how peaceful. Inner Mongolia is an Autonomous Region in the north of China. 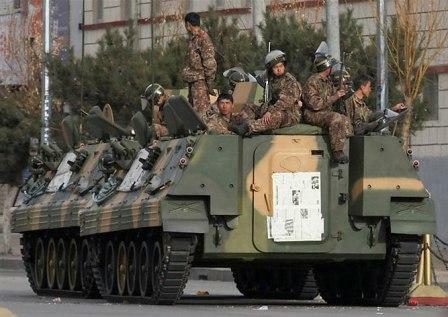 Beijing keeps a tight rein on the region, fearing ethnic unrest in the country's strategic border areas. The Inner Mongolian People’s Party (IMPP) seeks to achieve a greater level of self-determination for Inner Mongolia through peaceful means. Tibet, represented by the Government of Tibet in Exile, is headed by the Dalai Lama and describes itself as the rightful and legitimate government of Tibet. They characterize the current control of Tibet by the PRC as an illegitimate military occupation. The PRC government still exercises strong control of religious and political practices. The Taiwan Foundation for Democracy (TFD) seeks to advance the right of self-determination for the people of Taiwan and to promote democracy in Asia. Taiwan faces intense political pressure from the PRC authorities, who have frequently pressured other nations to exclude Taiwan from international multilateral mechanisms. UNPO expresses great concern for any unjust treatment of its members by the PRC. Although UNPO regards the Games as a non-political sporting event, UNPO also regards the Games as an important opportunity for international leaders to call for peace and non-violence in the PRC and its treatment of our members. Promote peaceful dialogue with UNPO member communities on the subject of increased autonomy and self-determination.